It's hard to decide what was better, the sleds or the scenery. It was a long, dark drive in my rented Subaru Crosstrek from the remote Bozeman, Montana airport to the town of West Yellowstone. I was trying to take in the beautiful scenery, but the snowy mountain roads rarely allowed any time to look around. When you have to navigate through unfamiliar twists and turns and brake for the occasional bobcat in the road, looking at pretty mountains becomes a rather low priority. But the drive was well worth it and I had plenty of time for natural sightseeing the following day. I was escorted to the Yellowstone Airport, a small, state-owned, public-use airport located on the northwest end of the national park. The big four snowmobile manufacturers were gathered in what I assume was a runway to test their new models at some of the best proving grounds in the world. 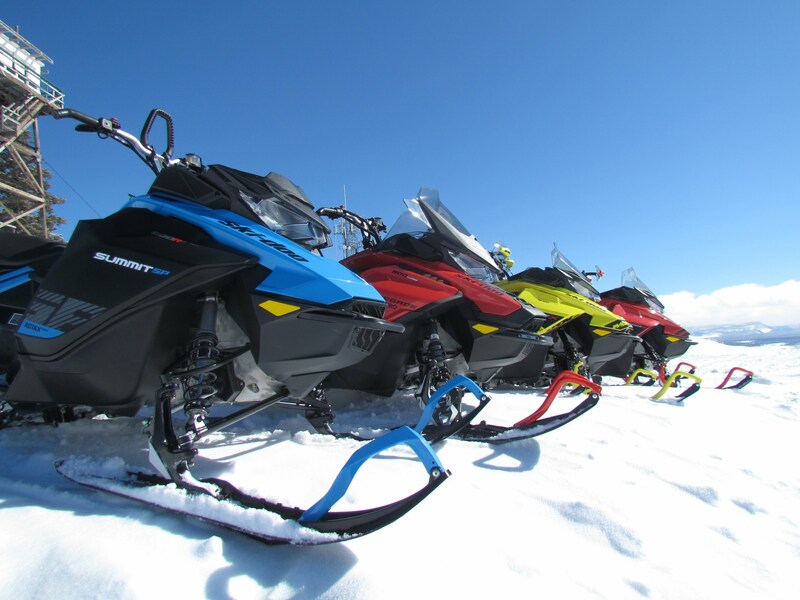 I entered the trailer marked with yellow “Ski-Doo” banners to get equipped before throwing a leg over a pre-production 2019 sled from the new lineup. I was lent some rather high-tech riding gear in lovely The Drive orange including snow pants, an insulated coat, gloves, boots, a helmet, and goggles. In any setting other than this one, I would have looked ridiculous, but it all kept me quite comfortable in what was about to be an exciting day. Once I was all prepped and ready to do some actual riding, the first sled I took for a spin was a red Ski-Doo Renegade Enduro. The one I rode was equipped with what just might be the holy grail of snowmobile engines (in the four-stroke realm, at least), the Rotax 900 ACE Turbo. It’s a turbocharged, DOHC, four-stroke, three-cylinder engine with EFI. It really wasn’t all that different from a modern car engine, but in a machine that only weighs 555 lbs. It’s hard to overstate how good this engine is. It simply does everything you ask it to do whether it’s going really fast right now or digging your way through some deep powder that would be impassable by a lesser snowmobile. It even has three driving modes: Standard for normal riding, Sport for flying down the trails, and ECO in case you’re not sure if you have enough fuel to get home. The Renegade Enduro is a snowmobile for making your own trails. It’s perfectly happy on existing paths, but where it really shines is in the powder. With 150 horsepower on tap and a grippy Ice Ripper XT track, there’s hardly anywhere this sled can’t go. The fact that the Enduro model has a windshield, a heated seat, and heated grips means you can play in the snow all day while keeping rider fatigue at a minimum without having to take breaks to reload your hand warmers. In fact, leave the hand warmers at the lodge. It didn’t take long for these grips to get so hot that I had to turn them down. Here I am posting to the Facebook story for all of you. 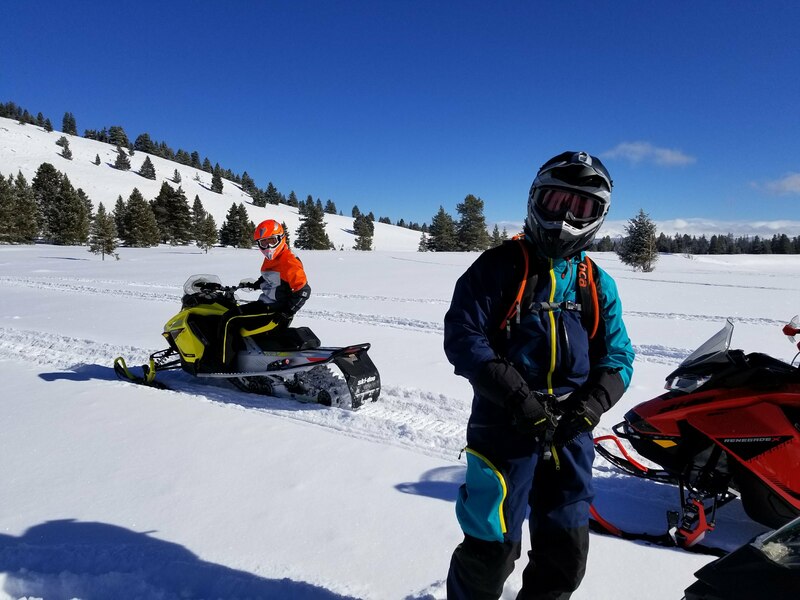 After a while of enjoying the rugged versatility and astounding performance of the Renegade Enduro, I switched sleds with another member of our crew. I hopped on a bright yellow Ski-Doo MXZ-X equipped with a direct-injected Rotax 850 E-TEC engine. Ski-Doo claims this is the most powerful two-stroke engine in the industry and I believe them. Despite having a lower displacement than the Renegade I just rode and no turbocharger, this engine has even more power at 165 hp. When I was flying across frozen Hebgen Lake covered in untouched snow on the MXZ-X, I could feel all 165 of those horses. Not surprisingly, this beefy two-stroke was much more rev-happy than the ACE Turbo engine. It has everything people love about two-strokes; a lot of power in a small package, as I mentioned, and lower weight. The MXZ (pronounced “em-ex-zed” by the many Canadians present) is the sporty sled made for the trails and that was instantly noticeable. The acceleration came on hard and fast without ever feeling like it was getting away from me and confident, tight handling made it a complete experience. Later in the day, I had a chance to try an MXZ X-RS which is the sportiest variant of the sportiest sled but had the smaller engine. This time it was a Rotax 600R E-TEC which is quite similar to the 850, but smaller. It’s still direct-injected and it still had a lot of the punchy power that I loved about the other MXZ I rode (albeit, less power), but this one had even better handling. Race-ready features on the X-RS package include a more forward steering post for a more aggressive riding position and reinforced suspension rails and running boards that can take tough landings after high-speed, high-altitude jumps. 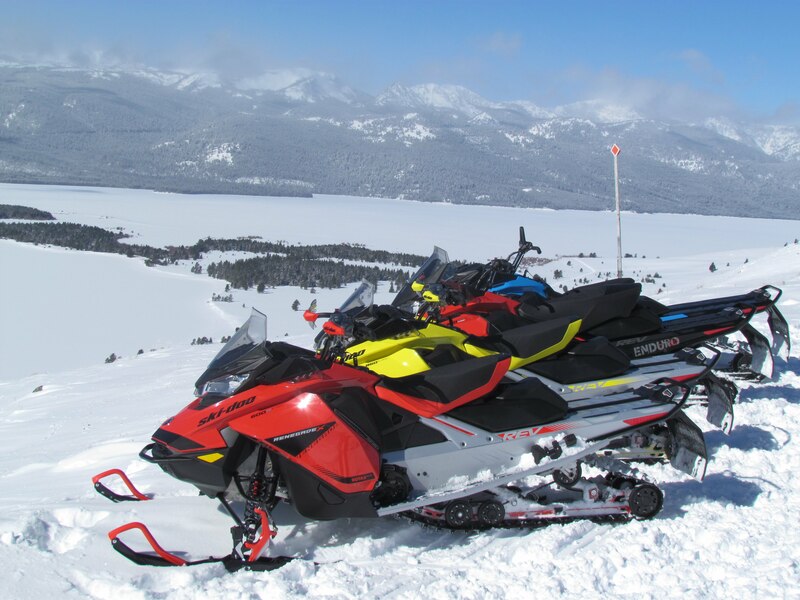 The last sled I rode wrapping up my Yellowstone adventure was a silver and black 2019 Ski-Doo Grand Touring Limited. This is the Honda Gold Wing of snowmobiles. If you and a passenger want to eat up miles on the trails in comfort, this is the machine for you. Refinement, comfort, and style come together with amenities like heated seats and grips for both the rider and the passenger, a nice back for the passenger, a massive 16.1-gallon trunk with options for even more storage, a tall windshield, and adjustable handlebars. The Grand Touring Limited I rode had the same Rotax 900 ACE Turbo engine I was raving about earlier. This one also has the same riding modes as the aforementioned Renegade Enduro and Sport mode is no joke. This big, luxurious sled gets up and goes plenty fast when you switch to Sport mode and I never quite got used to the sensation of hearing a turbo spool up while riding a snowmobile. But before I got on the Grand Touring Limited, the sled I rode before that was the highlight of the trip. We rode to a huge field with a few trees, but it was mostly wide open and covered in powder. The snow had seen some action from other riders, but a lot of it was untouched. This is where we had an opportunity for some free play to just bomb around on the snow with no trails to follow. It was there that I wielded what might be the ultimate weapon for this exact scenario. It was a black 2019 Ski-Doo Backcountry X-RS. This is what they call a “crossover” which has a much different definition in the snowmobile world than in the car world. A crossover, in this case, is a sled that excels in performance both on the trails and in the powder. It’s like the Renegade and the MKZ had a beautiful baby that has all of the strengths of both. In X-RS form, it has race-ready features similar to the MKZ X-RS like reinforced running boards. You also get adjustable performance suspension and two different ski stance positions to choose from. The cMotion suspension is what provides the best of both worlds making it not only competent but excellent both on groomed trails and in the unexplored frontier. It has rigid front and rear arms, a riding-rate motion ratio, and tipped rails for better cornering and more speed. The only engine available in the Backcountry X-RS is the Rotax 850 E-TEC two-stroke which is the right tool for the job. There are no pictures of me tearing it up on the Backcountry, but here's the big, beautiful field after some playtime. The Backcountry absolutely loved this vast field where it was free to stretch its legs. I was able to really crack it open and see what the Rotax 850 can do and I learned that it can do a whole lot. At no point was I worried about getting stuck in the snow or tipping over thanks to the excellent stability and handling that came from careful engineering. I was also never worried about getting bored because holy crap, can this thing rip. Don’t tell Ski-Doo, but I may have gone against the thing I signed at the beginning of the day promising I wouldn’t do any jumps (accidentally, of course). Frankly, I’m not an avid enough snowmobiler to feel really confident when I get airborne, but the Backcountry X-RS cured me of that uncertainty. 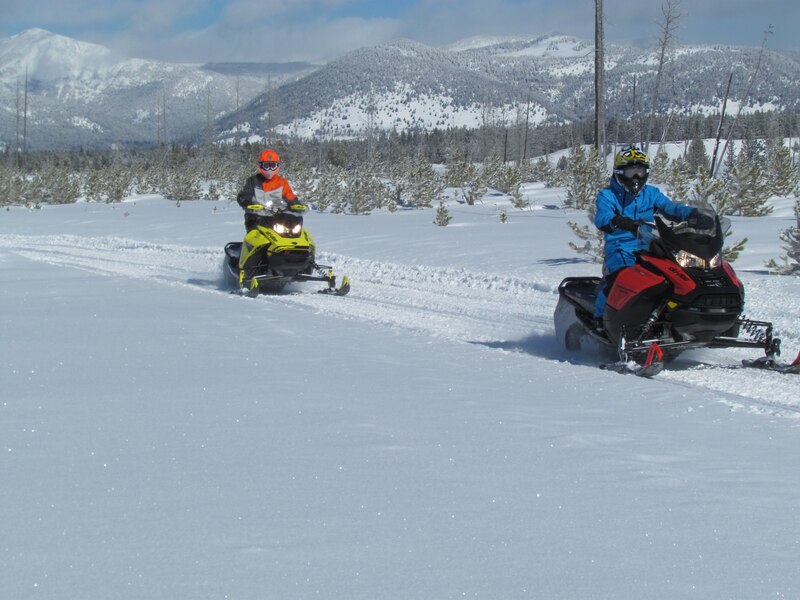 If you have a field of fresh powder in front of you and could pick any snowmobile to use to spoil the virgin snow, a Ski-Doo Backcountry should be towards the top of your list. My adventure with Ski-Doo at Yellowstone National Park was incredible, but it did have one big downside. It has kind of ruined snowmobiling for me forever. I’ll never be able to get on a snowmobile again without remembering catching air on the Backcountry, going wide-open on a frozen lake on the MXZ, or enjoying the grunt of the ACE Turbo engine on the Renegade or the Grand Touring all while being surrounded by the Rocky Mountains on a perfect day. Suddenly, the trails of Northeast Wisconsin where I live just don’t look that great anymore. So, I guess my only complaint about the 2019 Ski-Doo snowmobile lineup is that it is too good and it might ruin other sleds for you. But if you want a technologically-advanced machine that it obsessively engineered and purpose-built for the exact kind of riding you want to do, then there’s a 2019 Ski-Doo for you. Look for the 2019 models to start showing up in dealerships this fall.